As a follow up to my post on the story of Bloodborne last week, I’ve decided to take a look at another story in the game, tangential to the main plot, but interesting nonetheless. Spoilers ahead as we delve into a story of intrigue and tragedy, with an abandoned castle at the heart of it all. Deep in the Cathedral Ward, you find a man praying at one of the many altars. He’s a friendly sort who introduces himself as Alfred, protege of the great Master Logarius, and asks if you would like to engage in some jolly co-operation. You agree, and he’s pleased. As happy to find a friendly face in the beast-run streets as you are, he offers to answer any questions you might have. Though he says that he’s nothing more than a hunter like you, he does still seem to know a lot about the healing church. He points you to the Grand Cathedral, where Vicar Amelia can be found, and tells you that the leaders of the church, so they say, can be found high above, in the upper Cathedral Ward. You also ask him about Byrgenwerth, a name you’ve heard scattered whispers about, and he tells you of the college, and how they made a discovery of a holy medium in the labyrinth, the “tomb of the gods,” beneath Yharnam. You bid Alfred farewell and continue on your journey, venturing through Old Yharnam and past Djura, the hunter, on your way to retrieve a holy artifact from the Church of the Good Chalice. Your path crosses with Alfred again here, and you can cooperate to slay the Blood Starved Beast. Alfred wields a Kirkhammer, a weapon used by the hunters of the Healing Church, showing great strength. You overcome the beast, and part ways, taking the Pthumeru Chalice, which grants access to the “tomb of the gods” beneath Yharnam which Alfred mentioned. You don’t encounter Alfred again for a while, slaying Vicar Amelia, and learning the password of Byrgenwerth (“fear the old blood”). Alfred is found just before the door to the Forbidden Woods, which is guarded with a password. This time, though, he trusts you enough to tell you about the Corrupted Vilebloods, and his master, Logarius. He chokes up here, in grief or anger. You bid Alfred farewell, and push onward, into the Forbidden Woods. Deep in the woods lies a hidden cave, filled with poison, giants, and parasitic worms. Through this cave lies a tunnel leading to a backdoor to Iosefka’s clinic, where your journey began. The events of Iosefka’s clinic are a story for a different time, but within this decrepit hospital you discover an intriguing envelope. These old, blood-stained summons are an invitation to Castle Cainhurst, the very same which Alfred mentioned before. The carriage to the castle leaves from Hemwick Crossing. Bizarrely, the summons are addressed to you. Your curiosity gets the best of you, and you reach Hemwick Lane. A carriage pulls up, being pulled by some undead horses, but with no driver. 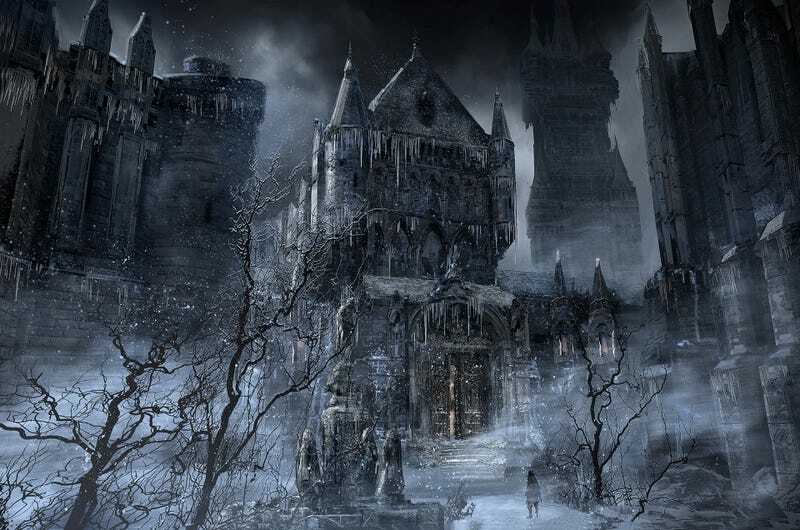 You get in and depart to the frozen castle of Cainhurst. The horses fall dead upon reaching their destination. As you step through the main gate, into the castle’s courtyard, the whole place seems abandoned. Old statutes, some broken, lie scattered everywhere, their once fine craftsmanship becoming weathered. You light a lamp, and step toward the castle’s door. You hear noises, and turn to see creatures crawl from a pit in the courtyard. These monsters look to have been human once, but now they are feral, pale beasts, with elongated arms and tongues, crawling on all fours, unable to walk normally any longer, as they gorged themselves so heavily on blood that their bellies have become so bulbous and red that your strikes cause them to burst in an explosion of blood. Are these the vilebloods Alfred told you of? Now sitting, crazed from hunger, awaiting their next meal in a frozen pit? After slaying these creatures, you enter the castle. To your surprise, you find life here, as maids scrub the floors of the lavish castle. The servants pay you no mind though, crazed in their duty to unseen masters. The haunting noise of women weeping can be heard echoing through the halls. You press on. Up the stairs lies a drawing room. It’s dark and empty, but the sound of wails seems stronger now. Stepping into the room you learn why, as ghostly apparitions, now visible, surround you. These crying women strike at you, but you manage to overcome them, and continue through a door to the walls of the castle. More statutes can be found on these walls, as lifelike as those below. As you walk, cautious what lies ahead, one of the statues lunges out at you. These gargoyles have skin the color of, or perhaps made of, stone, and will fight to protect the castle as fervently as the ghosts before them. Past these are more servants, though less friendly this time. These thralls aren’t cleaning, but protecting the inner castle, and won’t hesitate to take up a sword against you. Now you enter a large library, guarded by even more ghosts, and servants with blow darts. The ghosts grow in rage as you venture deeper in, some now headless, and angrily shrieking at you. As you explore this library, and the walls surrounding it, you discover the body of an executioner— wearing the same armor as Alfred wore before. These were the ones led by Logarius to cleanse this castle. One pair of these executioner’s gloves can be found which it says originated in a far off land, enchanted to fire dark spirits, passed from executioner father to executioner son. After exploring this area, you’re led to the rooftops of the castle, and carefully creep across the parapets. Atop the castle’s peak a frozen body waits upon a throne. It notices your approach. As this man stands up, ice cracks from his body, and falls from his large golden crown. The Martyr Logarius has been guarding this place for a very long time. He may not have moved in ages, but his strength and agility are quickly restored. Wielding a scythe, and dark arcane powers like those seen in the executioner’s gloves, he fights viciously, lending you no quarter. It’s hard to say whether he’s even truly aware of who he is anymore, or if he’s a shell, merely fighting out of instinct. Once, this man led the Executioners, who, it would seem, were precursors to the Healing Church, as their cloaked apparel would become the basis for the Healing Church’s garb. They may even have been precursors to the hunters, though they hunted beasts of a different sort— Vilebloods. This philosophy has rewarded him with an empty, hollow castle, cursed to protect a secret he can entrust to no one else. He’s done speaking of good and evil now, and during your fight he does nothing but roar. It’s a brutal battle, but you come out victorious. Logarius falls, finally freed from his duty, but with the evil he guarded now unleashed on the world. You take the crown from his body. This Crown of Illusions once belonged to the king of Cainhurst, and it was said to show the invisible. Logarius chose to wear the crown, and sit upon the throne, that no one else may find the dark secret it hides. You put it on your head, and see what cursed visions it brought him. A new tower appears, even higher than the peak you fought Logarius on. You travel up the steps, and discover the court of the queen of the Vilebloods. Two thrones lie at the end of a room filled with statues, and other miscellany. One sits empty, the other does not. A voice fills the hall. You kneel before the woman, enraptured by her. Logarius’ crusade almost succeeded. The executioners almost managed to wipe the Vilebloods out. Only one Vileblood remains, the queen of all, still awaiting blood dregs in hopes she might one day fulfill the Vileblood’s true mission, to create a child of blood, an heir for the Cainhurst throne. Logarius’ final charge on the castle of Cainhurst went askew though, somehow, as he discovered the crown likely taken from the Vileblood King’s head, and discovered the secret lying within, the Queen of the Vilebloods. What happened here, to convince a man so totally devoted to the cause of annihilating this menace, to spare the last one living? Whatever it was, Logarius knew he had no choice but to stand vigilant, an eternal warden to the last corruption seen in the land. Now, you have a choice. You can join Annalise, unleashing the Vilebloods on the world once again, while being granted the power of her rotted blood, or leave her, alone, in her castle of stone. If you join her, and swear loyalty to the Vilebloods, she sounds almost amused. Entering into this covenant with the queen grants you a Caryll Rune, “Corruption.” Corruption is the symbol of these Vilebloods, and the use of this rune is the swearing of an oath to their cause, pledging to seek out hunters as prey when you can, and returning to Annalise with any blood dregs you might find. Wearing this rune makes you a heretic in the eyes of the church, and the executioners, will consider you fair game. When one is a member of the Vilebloods, even attempting to seek aid from other hunters might go wrong, if they discover you’re a Vileblood, as they’ll choose to slay you instead. Within this room there also lies another summons, this one unopened. You choose to take it back to Alfred, telling him what you’ve found. Now you’ve truly helped him on his quest, to finish the job which Logarius started. He may very well be the last executioner, but now you’ve given him a chance to outlive the vampiric menace that he swore to see dead. When you return to Cainhurst, to help see Alfred’s quest through, you find something deeply wrong. In the court of the Vilebloods, you hear Alfred’s familiar voice with an edge you’ve never heard before. The friendly man you knew has vanished, replaced with a spiteful creature barking at nothing like a madman. Alfred wears a Gold Ardeo, a golden cone, on his head, and wields Logarius’ Wheel, a weapon of the executioners. You discover, with horror, as you approach the throne, that this is precisely what he’s done. He didn’t just kill Annalise, he eradicated her. There’s nothing left— Just a stain, some Queenly Flesh, sitting on the throne. He spits with wrath, and disgust. This is no throwaway comment. You realize, in shock, precisely what it was that made Logarius choose to become an eternal martyr. Even now, in this state of being— nothing but a pile of goo, Annalise’s flesh is still warm. Even now, this undying queen is just that— undying. Alfred cackles madly, his quest fulfilled, as far as he cares. As you talk to him, he starts to snap back to coherence, though still quite unhinged. This disturbing display by Alfred shows us a glimpse of his true nature, and possibly the nature of the executioners as a whole. We already know that the Healing Church, a related organization, are certainly not to be trusted, and while the executioners are perhaps not quite as cosmically dangerous, they’re certainly not to be trifled with. Previous From Software “Souls” games have had a covenant which, on the surface, seems similar to the Executioners, which you can now join. The Blade of the Darkmoon covenant in the first Dark Souls sought to punish players who had high sin, from killing other players. The Blue Sentinels sought to defend those who couldn’t defend themselves, members of the Way of the Blue, from invasions. The Executioners slaying Vileblood players seems to fill that role in this game, but it’s function is actually subtly nuanced in an important way. While the Executioners are slaying Vileblood players, true, it’s not by invading them specifically, or defending other players from invasion. Rather, if an Executioner and a Vileblood wind up engaged in co-operation through the Beckoning and Small Resonant Bells, they’ll be hostile to one another upon enter the same world. It’s my belief that this characterizes the Executioners not as defenders of the meek, like the Blue Sentinels, or seekers of justice, like the Blade of the Darkmoon (you’ll be hostile whether you’ve killed ten thousand players as a Vileblood, or have never even PVPed, and are just wearing the Corruption Rune for the stats), but as a group on a blind, bloodthirsty crusade. I don’t doubt Logarius’ noble intentions, he wouldn’t have sacrificed himself as a martyr otherwise, but without his leadership, and in association with (or being led by) the Healing Church, the executioners went wrong, and now they are nothing but mad men, hiding insanity behind a noble, meek, exterior. Alfred’s story is a tragic one. With no where left to go, and nothing left to do, he returns to the spot where you first found him. By the time you discover him there, though, he lies dead. His quest has been fulfilled, and without a purpose, he has nothing left to live for. Perhaps the most tragic thing, at least from a certain point of view, is that Alfred’s quest wasn’t as successful as he thought it was. You take the Queenly Flesh to the Altar of Despair, after slaying Ebrietas, and upon the altar of the very Healing Church Alfred worshipped, Annalise is restored to her former glory. Ultimately the executioners failed in their righteous crusade, and the Corrupted Vilebloods will continue the hunt, with no more martyr to seal them away. Again, anything related to these game’s lore will be to a certain extent filtered through my own interpretation, but I tried to keep this as “factual” as possible, or to mark when something was distinctly my opinion or idea. Most of this article comes straight from item descriptions, or dialog, with a smattering of the actual design of the world informing it as well. There are still some things about the story of the Vilebloods that I’d love to have clarified. What, exactly, gave Annalise her powers? Was it something found in the labyrinth? The corruption sure seems similar to the beast plague, did it come from the same source? Was that source Great One blood? Childbirth is definitely a theme toward the end of Bloodborne, is the child which Annalise wishes to have a Great One, like the others seen later on? What’s up with that betrothal ring? Are those things at the base of the tower Vilebloods that have gone feral? Still, Cainhurst Castle was one of my favorite areas in the entire game, not only because it provided for a great break from the victorian architecture and design of the rest of the game, but because it seriously felt like a throwback to classic Castlevania games, and considering the fact that the Souls series often feels like a modern progression on the Metroidvania format, it made for a really fun nod. There’s a lot of werewolves in Bloodborne, so it was fun to see this world’s version of vampires. The story of Alfred, Logarius, and the Executioners is pretty sad, especially since it’s likely all for naught in the end. Even if you don’t take Annalise’s flesh to the altar to be restored, someone might, eventually, over the eons. It’s tragic Souls storytelling at its finest, as you see one of the few people you’ve come to trust throughout the game reveal his true colors, and then likely kill himself, with no direction left in life. It might be almost completely removed from the main storyline, but that doesn’t make it any less strong as a whole. Note: This has been crossposted from my personal blog. Images were taken from the Bloodborne Fextralife wiki. The next post in this series, “The Hunter’s Nightmare,” can be found here.